Travel light or test out cult classics with Benefit's extensive range of deluxe minis. You may want to stock up on your favourite Benefit goodies in handbag-friendly sizes or try something completely new before committing to full-size products. Benefit deluxe minis are smaller and more affordable versions of the brand’s high-performance formulations. Keep your brows well groomed on the go with Gimme Brow Mini and Goof Proof Eyebrow Pencil Mini, two cult-classic brow products to fill in, shape, tame, and volumise your arches. Simply fill in brows with the easy-to-use Goof Proof Eyebrow Pencil. Then brush on volume with Gimme Brow for long-lasting hold. Flutter your way out of any situation with the Most Wanted Mascara Line Up Kit. This collection includes Benefit's three iconic mascaras plus a lash primer and gel eyeliner pen. With this kit, you can achieve any lash look: voluminous, long, or curled. Roller Lash and They're Real! Mascara and Liner are also available as individual miniatures if you have a firm favourite and style already in place. Double The Lip is a revolutionary lip product from Benefit. This lip makeup contains an expertly matched lip liner and lipstick all in one bullet to help define your lip line, adding both volume and dimension. The new Double The Lip Mini fits into the smallest of purses to give you a fuller pout wherever you are. Other Deluxe Minis include the bestselling Hoola Bronzing Powder, The POREfessional Matte Rescue Gel Primer, High Beam, and Benetint. 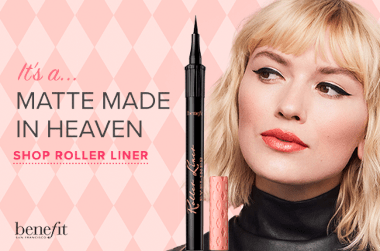 Amazing eyeliner that makes my morning makeup routine so much easier! I tried this mini version but would definitely invest in the full version next time. Super pigmented, only need 1 layer for a crisp super black. The felt tip is precise and easy to manage to give the perfect wing. So far it has lasted all day without rubbing, and I do tend to touch my eyes unconsciously.